Eye Tuck Serum online too expensive. Is there an alternative? I read about the instant eye tuck serum that's only sold online. I really would like to try something like that to help with my puffy eyes, but it's about $70.00 for a small bottle. I don't think I can afford that. Can you suggest something else that might help me? I'm 40 years old and had puffy eyes since my twenty's. Also, I have really dry skin and need to use a heavy moisturizer - especially in the eye area. I tried the Garnier (spelling?) Instant Eye Smoother cream. Well, it's really a cream and like a serum mixed together. It made the area look less wrinkled but it didn't do anything for the puffy eye look. Also, it was a little greasy and balled up throughout the day. Please don't tell me about cucumbers or tea bags. I'm over that! They don't work for me and I don't have the time. I work 2 jobs and have 3 teenagers! I've finally came across the Instant Eye Tuck Serum by Easy Eye Solutions. you....it lasts a long time. You can purchase the serum and illuminator hydrator cream for the price of one bottle of the serum. 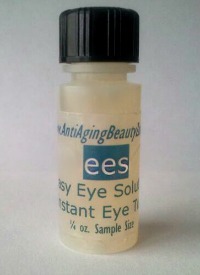 Click here to view more....Eye Tuck Serum Sample Bottle. Now the sample sizes don't come in the airtight pump bottle, but I've been carrying one around in my purse for 3 months now and it still works fine....not too mention how long I've had it. If you like it and it agrees with you - then next time purchase the full size bottle. It will last close to 6 months which really brings the cost down to about .25 per application. When you think about it - if it works for you and does what you want - .25 cents is not a lot. Especially considering all the money you (and I) have spent over the years looking for something that works to smooth out the under eye area. Please write back and let us know how it works for you. And, remember, less is more. Start out using a tiny amount - like the size of a grain of rice. You can always add more if you need it. One woman (Toby) who first introduced us all to this product says she mixes it with her under eye concealer makeup and applies that way. There is a little learning curve for some - but it's so worth it. I wear mine everyday and wouldn't want to leave the house without it. Comments for Eye Tuck Serum online too expensive. Is there an alternative? Amy and anyone else interested in trying the Instant Eye Tuck Serum. In addition to offering smaller sample size bottles, the manufacture is now offering Free Shipping! Now would be a great time to try it and see how well it works for you.